Cheer Collection body pillow provides all the comfort you are looking for to cuddle and relax. Great for Nursing, relaxing and many more positions. This body pillow offers the utmost comfort and quality and is an essential product for people looking to get a good nights sleep. This is a great sectioned pillow, great for reclining in bed, and looking at my phone, using it as a headrest so that I won't strain my neck. 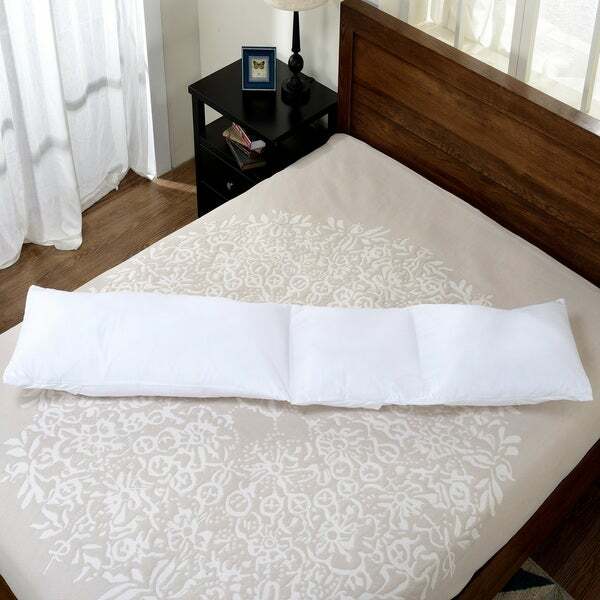 Very comfortable, can be used for a body pillow as well, and can be easily stored away since it's a folding pillow. I love this body pillow. It is jointed (I suppose that’s what you would call it) and it is wonderful for folding under your knees, behind your head to watch TV, or to add support while laying on your side. It has the perfect cover for washing and is usable in many positions. Will buy others as needed! More comfortable than a regular body pillow. Fits your nooks and crannies. This pillow is soft and very flexible! It is durable and very comfortable! I highly recommend this for anyone who has to sleep with multiple pillows. It has eliminated two of my smaller pillows. I like that it's light and has section so it's easy to fold over. The only think I would change is cover of the pillow inside is a tough/cheap material. It'd be better if they enclosed it with a higher quality material. The case on the outside is okay but could be better. I'm still happy with the purchase. This turned out to be a back-saver after my surgery. I could only sleep on my left side while healing, and this provided me with both lumbar and neck support. Very pleased with the purchase. All a you need and then some. This is one long pillow perfect for the side sleeper that needs that led and arm support. I had bad knee and this does great supporting my leg while sleeping on my side. Comfy cozy and long. Shipped fast packs well but lousy product in my opinion. I do realize and did read down alternative, and I’ve had other items tht were down alternative this is hard and not good at all. There is no fluff no squish. Sorry to be a Downer but I am disappointed and sending back. Give the pillow a few hours after opening it and it will fluff up. It is perfect size to put my arm around and between my knees. I have a pinched nerve and have to have a pillow that’s not too thick or too slim to keep my arm propped up. The only negative thing is the pillow case material is a bit scratchy. Very nice pillow. perfect size. Exactly what I needed to build a foundation under my pillows for our trundle bed! I’m planning to get one for my bed too!